Epidemiologic studies report a protective association between non-steroidal anti-inflammatory drug (NSAID) use and hormone receptor-positive breast cancer risk, a finding consistent with NSAID-mediated suppression of aromatase-driven estrogen biosynthesis. However, the association between NSAID use and breast cancer-specific mortality is uncertain and it is unknown whether this relationship differs by hormone receptor status. This study comprised 935 invasive breast cancer cases, of which 490 were estrogen receptor (ER)-positive, enrolled between 1996 and 2001 in the Carolina Breast Cancer Study. Self-reported NSAID use in the decade prior to diagnosis was categorized by duration and regularity of use. Differences in tumor size, stage, node, and receptor status by NSAID use were examined using Chi-square tests. Associations between NSAID use and breast cancer-specific mortality were examined using age- and race-adjusted Cox proportional hazards analysis. Tumor characteristics did not differ by NSAID use. 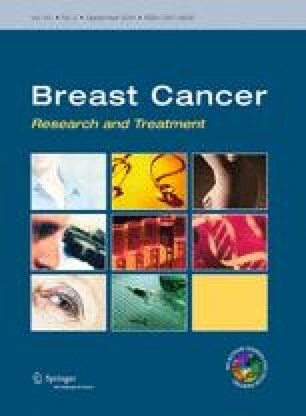 Increased duration and regularity of NSAID use was associated with reduced breast cancer-specific mortality in women with ER-positive tumors (long-term regular use (≥8 days/month for ≥ 3 years) versus no use; hazard ratio (HR) 0.48; 95 % confidence interval (CI) 0.23–0.98), with a statistically significant trend with increasing duration and regularity (p-trend = 0.036). There was no association for ER-negative cases (HR 1.19; 95 %CI 0.50–2.81; p-trend = 0.891). Long-term, regular NSAID use in the decade prior to breast cancer diagnosis was associated with reduced breast cancer-specific mortality in ER-positive cases. If confirmed, these findings support the hypothesis that potential chemopreventive properties of NSAIDs are mediated, at least in part, through suppression of estrogen biosynthesis. This work was supported by a SPORE in Breast Cancer [P50-CA058223] and the University Cancer Research Fund, University of North Carolina at Chapel Hill.